Suddenly there seem to be an avalanche of waterproof/adventure type camera as of this year. AFTER I’ve bought my Olympus mju1030 which I’m not too happy with! This one seems to look good. I like the funky design too! Canon has launched the PowerShot D10, its first waterproof digital compact. It is claimed to be waterproof up to 10 meters, freeze proof up to -10 degrees, shockproof when dropped from a height of 1.22 meters and dust proof. In addition, there are a range of optional protective accessories available. The camera has a 12.1MP sensor, 3x optical zoom and a 2.5″ LCD, and includes Smart Auto Mode, Face Select & Track, Blink Detection and Face Self-timer. More info; Powershot D10 brochure or US or here. Panasonic’s first rugged digital compact and the world’s first to feature AVCHD lite HD video recording. The TS1 (FT1 in Europe) is designed to be dustproof, waterproof up to 3 meters and shockproof up to 1.3 meters. It incorporates AVCHD Lite video compression in 3 quality levels to allow longer HD video recording. Sporting a 12.1MP sensor, 28-129mm equivalent lens and 2.7″ LCD, the camera also includes features such as Intelligent Auto Mode, Optical Image Stabilizer and Face recognition. More info; US or here. 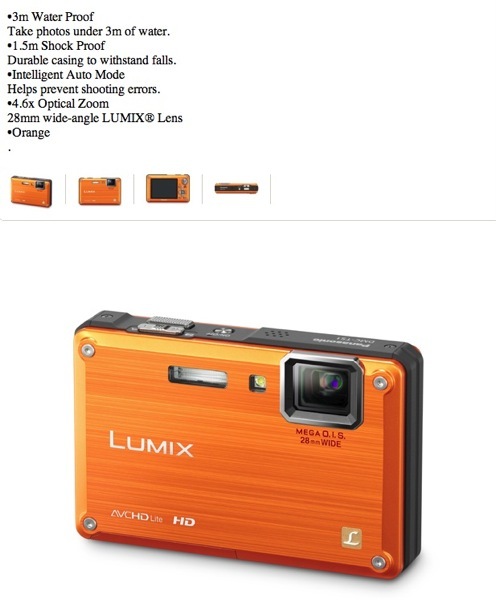 I’m thinking of Lumix ….